Actor Cara Delevingne at CinemaCon 2017 The State of the Industry: Past, Present and Future and STXfilms Presentation at The Colosseum at Caesars Palace during CinemaCon, the official convention of the National Association of Theatre Owners, on March 28, 2017 in Las Vegas, Nevada. This ice-blonde bob Cara Delevingne wore to CinemaCon 2017 was a perfect marriage of vintage and futuristic! 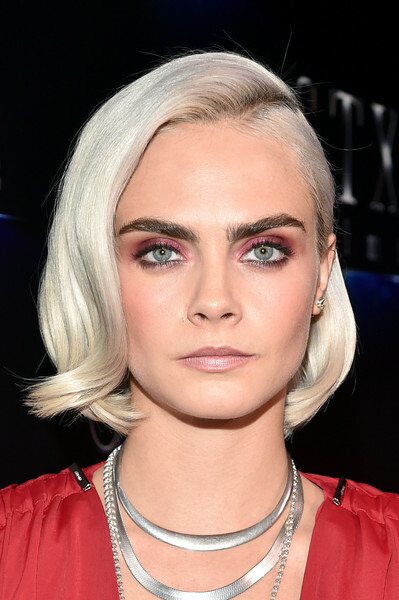 Cara Delevingne played up her gorgeous eyes with a heavy application of pink eyeshadow.